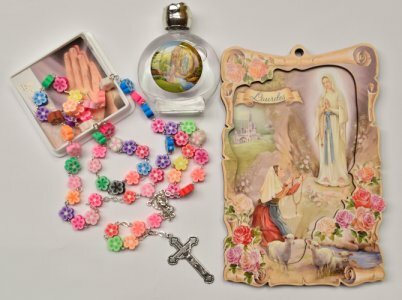 DIRECT FROM LOURDES - Lourdes Wall Plaque & Holy Water Gift Set. > Children's multi colored soft resin petal shaped rosary beads with how to say the rosary prayer card. > 2D wall plaque depicting bernadette and Our Lady of Lourdes. > A bottle of Lourdes water, bottle measure 5 cm tall.